Dancing Chicken Farm is the work of retired school teacher and improbably light-on-his-toes dancer Marvin Kosmal. Located in LaCenter, Washington, Dancing chicken is a six acre farm that’s focused on chicken, duck and quail egg production. Marvin and his selling partner, Ellen Houx supply eggs to 15 area restaurants and countless shoppers at the King, Shemanski and PSU Markets. 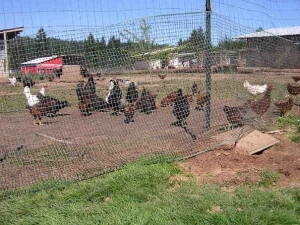 If you mention this post, at the April 18th PSU Market, the Dancing Chicken folks will give you a dozen duck eggs. Although, slightly bigger, Duck eggs can be substituted for chicken eggs in cooking – they’re especially good in carbonara, poached on top of sauteed chard and creamy polenta or just over easy; possibly scrambled. Duck eggs are even more tasty with the price of free. One week only, while supplies last.